Twelve diocesan and order priests concelebrated the Mass of Thanksgiving for the Carmelite sisters of Indianapolis with Msgr. Joseph F. Schaedel, vicar general, on July 16, the feast of Our Lady of Mount Carmel, at SS. Peter and Paul Cathedral. Their smiles and applause as Msgr. 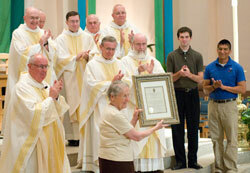 Schaedel presented a proclamation to Carmelite Sister Jean Alice McGoff, prioress of the Carmel at the former Monastery of the Resurrection, at the conclusion of the Mass demonstrated their love and respect for the cloistered nuns. On June 30, the nine sisters of the Indianapolis Carmel moved to Theresa Hall at the motherhouse of the Sisters of the Third Order of St. Francis in Oldenburg to begin a new chapter in their lives of contemplative prayer. Last spring, the Archdiocese of Indianapolis purchased their castle-like monastery for use as the Bishop Simon Bruté College Seminary. After the liturgy, Father Eric Johnson, archdiocesan vocations director, reflected on the sisters’ lives of prayer in Indianapolis. He said archdiocesan seminarians who will live at the former monastery will benefit from the sisters’ long tradition of contemplative prayer there during the past quarter century. Benedictine Father Boniface Hardin, a Saint Meinrad monk who founded Martin University in an inner city neighborhood in Indianapolis, praised the sisters for their strong faith and said he always enjoyed celebrating liturgies at the monastery. Jesuit Father Thomas Widner, rector of the Society of Jesus priests and brothers in ministry at Brebeuf Jesuit Preparatory School in Indianapolis, frequently celebrated Mass with the sisters at their chapel and said he will miss them. “It is partly sadness, partly hope, partly some joy,” Father Widner said about their move to Oldenburg. “It’s a lot of mixed feelings, I guess, because I’ve been out there regularly to celebrate Mass with them on Sundays. I’ve been doing that since the 1970s … while I was here in the diocese. When I left the diocese for many years [on ministry assignments], I would be out there on Christmas for Mass. They’ve been a great support to me personally … as well as to lots of others. Father John Hall, pastor of St. Martin of Tours Parish in Martinsville and administrator of Our Lady of the Springs Parish in French Lick and Christ the King Parish in Paoli, recalled childhood memories of participating in the sisters’ nine-day novenas on the monastery lawn. He grew up in Our Lady of the Greenwood Parish in Greenwood, and helped his father, Joe Hall, set up the public address system each night of the novena in July leading up to the feast of Our Lady of Mount Carmel. He was thinking about the priesthood while in grade school, and fascinated by the sight of thousands of people coming to the monastery to hear the priests preach and preside during Benediction of the Blessed Sacrament, the rosary and the Litany of Mary. Looking back, Father Hall said, he believes that his early experiences with Carmelite spirituality during the novenas had a part in his decision to study for the priesthood.